GetDivorcePapers.com provides professionally completed, 100% court-approval, money-back guaranteed Delaware divorce forms. Just create an account, complete the interview, and file for divorce. Our case managers do all the work for you, and send the completed Delaware divorce forms when they are ready to be filed. It is essential for either of two parties to be resident of Delaware for at least six months prior to filing the case. All papers are required to be submitted in the county of any of the two individuals. Courts of law in Delaware declare divorces on both the reasons; no-fault and fault. In the context of no-fault divorces, a marriage may come to an end due to a prolonged separation between the husband and wife. In other cases there are many reasons that become the major cause of the divorces in Delaware. These may include aggressive behavior of the husband or wife, non-compatibility, inability to meet the financial needs, and committing some crime and imprisons. 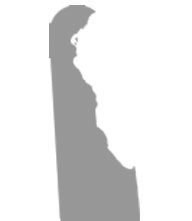 State of Delaware may declare the joint custody or sole custody of the child depending upon its best upbringing. Preference of the child is given sheer importance depending upon his/her age and decision making ability. Moreover, social circle and status of the child is taken into account. Education expenses and peaceful environment also become the major aspects. In this regard, any indications of the violence within the domestic capacity, and use of slangs are given the most importance in decision by the court. Then the total numbers of the children also become a significant factor in deciding the custody. In the last, wealth and financial strength or weakness of both parties are also taken into account. This state provides its inhabitants with the equal rights in the property distribution after the divorce. In this regard, both the spouses get an equal amount of the property that is attained during the marriage. All other separate properties are not divided in it and such properties remain in the hands of their real owners. In addition to these, total duration for the marriage lasted for, financial obligation of both spouses, and their employment is given importance in property distribution. Delaware provides either of the spouses with sufficient spousal support to live a better life. If he or she is completely depending on the other, then court may charge the spousal support onto the other. The amount of this support is determined by the needs of the spouse who is going to receive it. The state enforces on both of the parents to fully fulfill their duties for the child support. Either of them or both have to pay for the support depending upon the health and needs of the child, their monthly income, tax liabilities, and social needs of the child. Delaware provides the mediation to the parents to a great extent. It provides a time period of 60 days for the parent to rethink about their decision and counseling. Moreover, it offers the parents to become a part of parenting course if there are some evidences of domestic violence. There is no need of a lawyer when applying for divorce in the state of Delaware. A divorce case which is filed without any help of an attorney in any of the states is known as Pro Se Divorce. Literally, Pro Se is a Latin phrase and it means "on her or his own". Process of getting the divorce without the help of lawyer may vary from one State to another. These types of divorces are perfectly legal and enforceable in Delaware, and are actually very convenient. Usually, once settlements have been made regarding property distribution and custody matters among the spouses in case of a mutual divorce, Pro Se Divorces are filed.